When the Olympic Saddledome opened in Calgary’s Stampede Park in the winter of 1983, it was an optimistic time for the city. The local economy had begun to rebound after oil market price shocks had subsided. The Calgary Flames had made the playoffs for their first three seasons in town, playing in the cozy-if-antiquated Stampede Corral. And the city was well on its way to hosting the 1988 Winter Olympics. As 2014 chugs along, the beloved Scotiabank Saddledome has entered the same field of conversation that the Corral did in 1983. Residents love a good many things about the arena, but would jump at a moment’s notice to replace it. Madison Square Garden, opened in 1968 and renovated a multitude of times, most recently this year at a reported price tag of over $1 billion. Nassau Veterans Memorial Coliseum, opened in 1972 and soon to be vacated by the NHL when the New York Islanders head to Brooklyn for the 2015-16 season. Rexall Place, opened in 1974 and soon to be vacated by the NHL when the Edmonton Oilers move to Rogers Place for the 2016-17 season. Joe Louis Arena, opened in 1979 and soon to be vacated by the NHL when the new Red Wings arena is built – a project that is funded and looks on-track for a year or two after Edmonton’s arena opens. 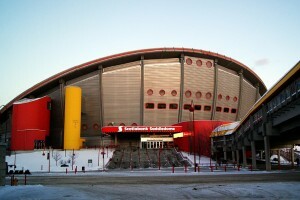 The Saddledome was renovated in 1995, but remains what it is – an arena dubbed by Flames president of hockey operations Brian Burke as “state-of-the-art in 1988” at a Chamber of Commerce breakfast. The cool-looking paraboloid roof causes snow to pool at its center and reduces its weight-bearing ability, making it really tough to hold concerts or events with big lighting rigs – the Ultimate Fighting Championship was given a very small window of dates to choose from when they visited for UFC 149. So, why not just build a new arena? The Flames want to. They’ve been discussing it for years. Every public appearance for Flames president Ken King involves fielding a multitude of questions from fans and media about the Saddledome’s future. The organization is said to have plans. Do they have land? As of yet, no. Do they have the money (to get the land or build a new building)? Calgary’s ownership ranks among the wealthiest people in Alberta and Canada. Two of their owners are billionaires. But given the economic impact of the Flames and a new building – and the notion that rich people get rich by not spending much of their own money – the likely hope was that some level of government would kick in funding. Edmonton Oilers billionaire owner Darryl Katz underwent a lengthy, public (and at times bitter) negotiation with Edmonton’s city council before the $480 million Rogers Place project was approved, with the city kicking in roughly $200m. Granted, that project is a huge part of revitalizing Edmonton’s downtown. Many have speculated that the new Calgary arena could play a part in revitalizing Calgary’s downtown East Village in a similar funding arrangement. Well, except for the fact that Calgary mayor Naheed Nenshi has a legislative agenda focusing on transit and infrastructure development, and has publicly opposed giving public money for a new building for the Flames. The provincial government has had budget problems in recent years and is also cool to the idea of funding the project. Barring a sudden governmental change of heart – or a future Winter Olympic bid and subsequent federal government funding – the Flames may need to foot the bill themselves. Either way, it’ll take a long time. Recent estimates are if the Flames decided tomorrow to go it alone, an arena project would take roughly five or six years from concept to puck drop. And bids for the 2026 Winter Olympics aren’t accepted until November 2017, which would place the new building’s opening around 2023 – for the record, this is how the Saddledome was funded and built in the first place. The Calgary Flames lease in the Saddledome expires later this year. The lease’s renewal is generally expected to be a rubber-stamp situation, though the length of that term will be interesting. Depending on what funding arrangement the team is hoping for, the Saddledome will be home to the Calgary Flames for the next five-to-nine years. The lease renewal will probably be the first major clue as to how long their tenure will be, and where they hope to get the money for a new home.